ATLANTA (AP) -After his team missed the playoffs last year, Carolina coach Peter Laviolette wants his team to show better focus. Even an easy win over the Atlanta Thrashers wasn't enough to satisfy Laviolette. "We were on the short end of a few things - work ethic, determination, grit," Laviolette said. "As a whole, we need to be better than we were tonight." Eric Staal scored his 35th goal and Sergei Samsonov added a goal and an assist in the Hurricanes' 5-3 victory on Wednesday night. Since Feb. 21, Carolina has won 10 of 12, including three victories over the Thrashers. Staal agreed with Laviolette's assessment of the Hurricanes, though both were impressed with the effort of goaltender Cam Ward. "He played well in the first period," Staal said. "It could've been a drastically different game if make those saves." The Southeast Division-leading Hurricanes, who improved to 5-1-1 against Atlanta this season, led 3-0 after Staal beat goaltender Johan Hedberg with a wrister from the slot 13:33 into the first period. "I could've played better tonight," Staal said. "We had some guys step up and let us get the win." Ward stopped 31 of 34 shots after making his 13th straight start. The first period included 10 saves, six of which came during a 1:39 stretch that ended at the 11:35 mark. Two of Ward's better efforts came on stops of a backhander and a wrister by Todd White. The first shot came from 14 feet, the second one from 13. "I was seeing the puck pretty well," Ward said. "It's always good when you take an early lead in the game." Carolina led 3-0 by the 13:33 mark of the first period, ending with Staal's wrister from the slot. Samsonov made it 2-0 with his 13th goal less than 7 minutes before Staal scored. Hedberg appeared to be screened from seeing Samsonov's shot, a wrister that beat him from outside the top of the right circle. Thrashers captain Bobby Holik, who engaged in a shoving match with teammate Eric Boulton in a loss at Philadelphia the night before, expressed disgust with his team's poor play in front of Hedberg. "We were disrespectful to our hardest-working player tonight, leaving him in there like that and to get peppered by great scoring opportunities," Holik said. "I have nothing else to say about the game." Hedberg stopped 28 of 33 shots as he dropped to 14-13-3, but he saw the outcome differently than Holik. "We battled and showed a lot of character trying to come back," Hedberg said. "We have to play for our fans and our pride." Atlanta has won just two of its past 15 games. Slava Kozlov had a goal, his 17th, in the final minute and assisted on Bryan Little's fifth goal in the second. Three minutes after Little swept the puck past Ward, defenseman Steve McCarthy added his first goal to make it 4-2 at the 4:56 of the period. 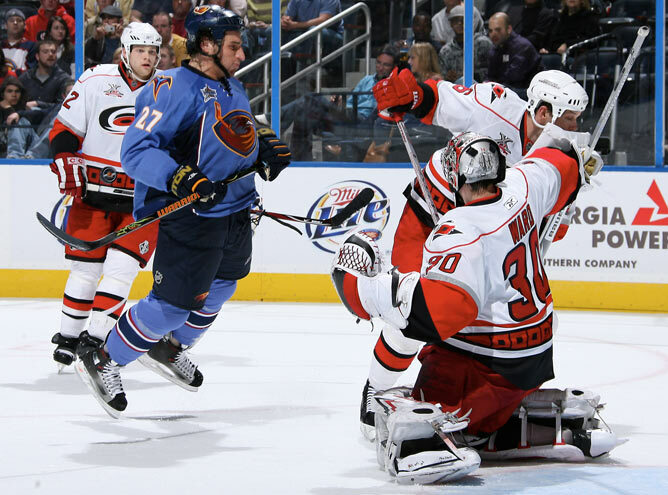 The Hurricanes improved to 12-3-1 since team captain Rod Brind'Amour suffered a season-ending knee injury last month. Over the past 16 games, Staal has 26 points, including eight goals, to lead the NHL since Feb. 14. Staal, who was the MVP of the All-Star game two months ago in Atlanta, has six goals and six assists against the Thrashers. Erik Cole scored his 21st goal, getting an assist from Samsonov, to give the Hurricanes a 5-2 lead with 5:09 remaining. Trevor Letowski's sixth goal, a wrister from the right circle, opened the scoring 4:04 into the first. Carolina reached 40 wins for the third straight season. Notes: Against the Southeast Division, Carolina is 16-8-1 and Atlanta is 12-12-1. ... The Thrashers, who won their first division title last year, are 14th in the Eastern Conference with 70 points. ... C Matt Cullen missed his second straight game with a head injury.